Memphis Game Developers home-growing programmers. The first time I spoke with University of Memphis (U of M) computer science professor Ernest McCracken, the brains behind Memphis Game Developers (MGD), his team of indie programmers was building Fallen Space, an open-world alien survival game. Since then, they've curated a solid community of indie programmers and artists. U of M now offers a three-hour credit course in Unity Game Development, which McCracken teaches. Students will soon also have access to the U of M's first virtual reality lab. MGD members can also now use Microsoft HoloLens. "WTF are HoloLens?" you ask? They're a "game-changing technology," McCracken says — enabling users to interact with holograms in our world. I caught up with McCracken to see how new technology has furthered Memphis as an indie gaming mecca. Memphis Flyer: How much progress has been made on Fallen Space since we last spoke? Ernest McCracken: Fallen Space has been in deep crunch development. When developing a game, we almost forget about all the small nitpicky project-level things we have to manage. So far we've got a basic framework for the game that lets the player create a procedurally generated universe and freely fly around in it. We're adding more content to this universe; the player can now have a squad of ships and manage inventories. MF: How did the three-hour credit course at U of M come to be? EM: I was already teaching other classes at the University of Memphis. The department asked me if I'd like to teach it, and I was thrilled to say yes. We cover a fairly large range of game topics in the course from breaking down why textures look so good in modern games to the basics of scripting and animation. By the end of the course, a student will be able to create simple, physics-based games and get a good taste of programming. I believe we currently have 23 students enrolled. It had been a class when I was a student, but only briefly. Not many professors have experience in the field. MF: Why is having access to HoloLens such a big step for game development? EM: Augmented and mixed-reality systems like the HoloLens are game-changing technologies. Companies are already investing in virtual reality (VR) for training purposes. It can be expensive to train mechanics on real equipment, so VR offers a huge potential in savings while offering extremely immersive training. Augmented Reality (AR) takes that one step further by overlaying on top of the real environment. It would help both train and assist surgeons, for example. MF: U of M will soon have its first virtual reality lab. What will students have access to, and what all can they learn using VR technology? EM: It was an idea presented by one of our members. It served a dual purpose. First, we wanted a meet-up location that was close to campus to attract more students. We also needed a dedicated space for room. VR requires a fair amount of open space. Students will have both Oculus Rift/Touch and HTC Vive as well as other tools for game development like drawing pads for texturing. 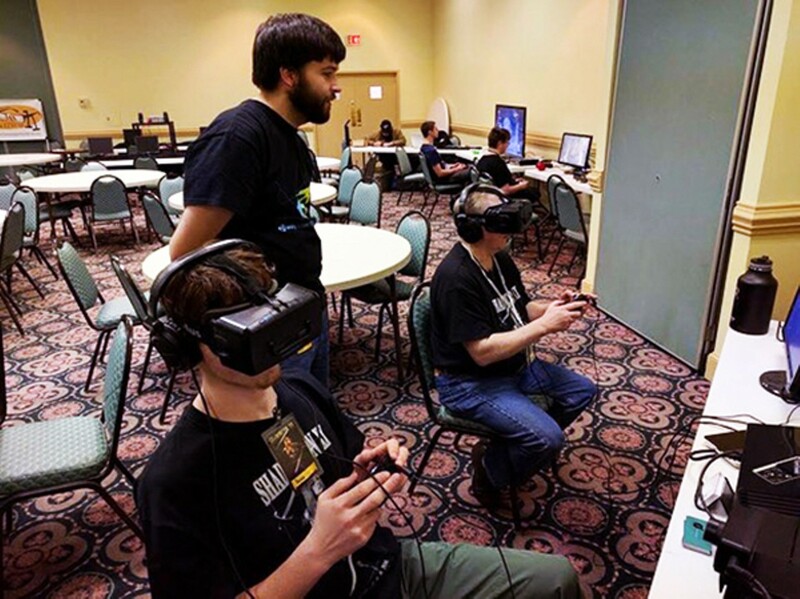 Getting started in virtual reality actually does not require much more than the same skills for game development.